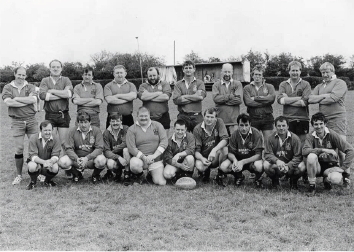 After a couple of abortive attempts, New Ross RFC was founded in 1936 by the late Paddy Fleming who rounded up players, helped coach them, arranged fixtures and transport, obtained pitches and looked after the numerous duties involved in running a club. As only 4 or 5 of the original players had ever seen a rugby match, it took a while before the club found its feet, but by degrees they became a force to be reckoned with. In 1939, the Club recieved a boost when a battalion of the Irish Army was stationed in New Ross and supplied many fine players to the local Club, with the end of WW2, and the withdrawal of the Army from New Ross, the Club declined. 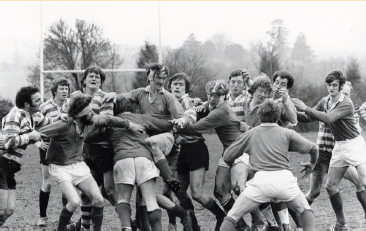 In September 1970, rugby was re-introduced in New Ross with training taking place in the car park of the Five Counties Hotel and the first match taking place in Wally Gannon's Hillfield. The Club acquired its current grounds before the end of that season and the Club Pavillion was erected in 1974 by voluntary effort by the members. The Grounds have been substantially modernised and properlylaid out in the years since then and currently boasts 2 of the best pitches to be found anywhere in Leinster. The Majority of Club training now takes place in the training facilities at Good Counsel College. The Club is substantially larger than the club of the 70's when there was just one team. 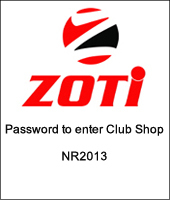 In the 2014-2015 season, the Club will field 3 adult men's teams, an adult ladies team (playing in the AIL), youths teams at U19, U17, U15 and U13, U18 and U15 ladies as well as catering for a vibrant minis section with players from U12 to U7. All of this activity is supported by an enthusiastic group of voluntary coaches and parents and overseen by the Club Management Committee.